Potato Bake Recipe with Parsnips | Simple. Tasty. Good. Holy smokes! 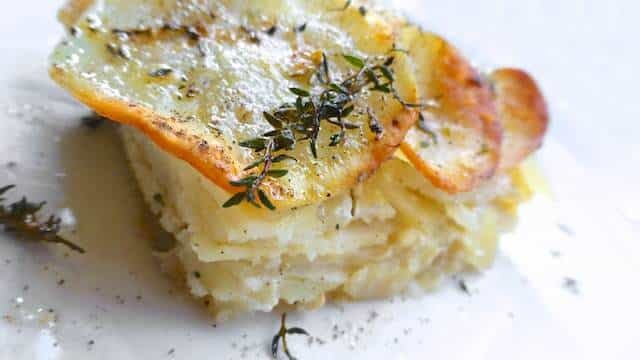 Now this potato bake recipe with parsnips is one hell of a dish! Scalloped potatoes and parsnips simmered in cream and milk until super soft and smooth. And nope, believe it or not then but there’s no cheese in this dish whatsoever. Not that I’m on a diet, I just thought I still had some grated cheese left in my fridge but that proved to be a mistake… No problem! A few knobs of butter and a preheated grill saved the day! Love parsnips? Then also check out my parsnip soup with cinnamon croutons!